With short gaps in-between the races, there is no time to gather breathe, which is good news for the riders. Those who disappointed in E3 have an instant chance to do better. The profile makes it look rather easy, but it’s far from that. The distance of 251.5km makes this a selective race, add in the double ascent of the Baneberg and Kemmelberg, and you’ll start to see why we never get a big group at the end. Like all races in this part of the world, the weather is hugely important. Sunny and actually relatively warm for this time of year. The wind is to be a constant 16mph, which isn’t overly strong, but the direction is perfect for echelon action. Coming from the north-east it is a cross/tailwind for the majority of the opening 160km of the day. With some very exposed roads, we could see a lot of riders already dropped before we reach the climbs. The bad news is that it’s a headwind straight after the final climb of the Kemmelberg until Ypres, which will slow down those who want to attack on the climb. 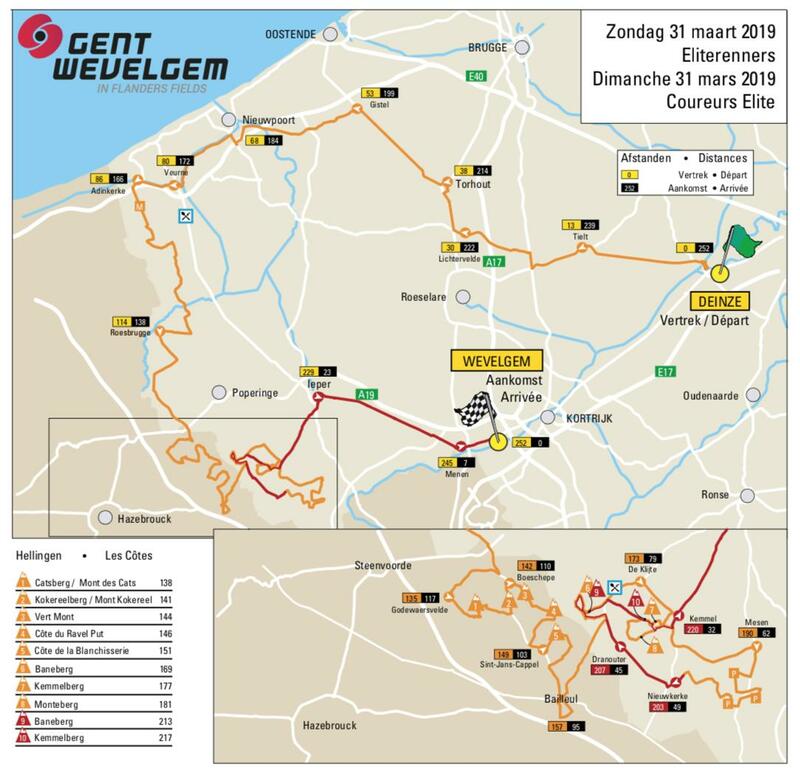 Once the riders reach Ypres, the wind is a cross/headwind until the finish in Wevelgem. I think the wind will have a large impact on the race, most teams will be happy to make the sprinters work hard and deaden their legs. The teams will have the same plan, split it in the crosswinds. The idea is to reduce the number of domestiques rival teams have, forcing the team leaders into working and wasting energy. 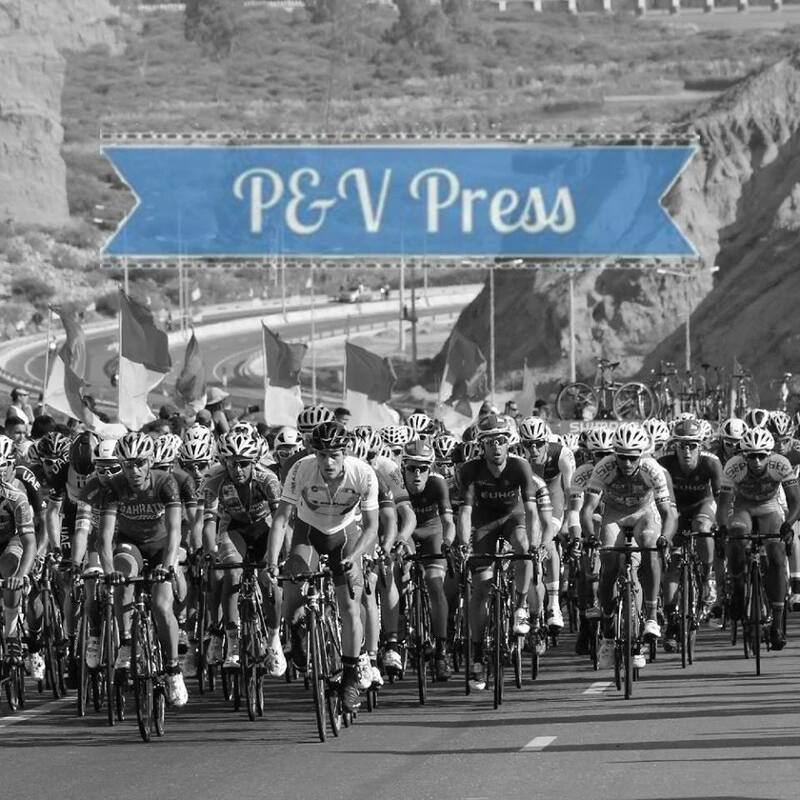 Once into the climbing section, we’ll see the usual tactic of trying to place riders in breakaways, which is actually very hard to do. The plug streets provide an opportunity of again dropping riders. It frustrates me that the sections aren’t that long, but damage can certainly be done. Then we have the final ascent of the Baneberg and Kemmelberg, this is where we see the final selection. The Baneberg is 1.2km at 6.7%, with a maximum of 12%. This adds to the general level of fatigue, especially as it comes after 210km of racing. Roughly 900m at 8.4%, plus some rough cobbles. This is the main point in the race, how selective will it be? The Form Guide – Who’s Hot? Zdenek Štybar– winner of Het Nieuwsblad and E3, the Czech star is flying at the minute. He also finished 4th in Strade Bianche, he’s in the form of his life. Oli Naesen– 10th in Het Nieuwsblad, in the break in Kuurne, 2nd place in the final stage of Paris-Nice, 2nd in Sanremo and 8th in E3. Greg Van Avermaet– stage win in Valenciana, 2nd in Het Nieuwsblad, 6th in Strade Bianche and 3rd in E3. Wout Van Aert– 13th in Het Nieuwsblad, 3rd in Strade Bianche, 6th in Sanremo and 2nd in E3. Mathieu Van Der Poel– winner of GP Denain. Matteo Trentin– stage win in Valenciana, two stages in Andalucía, 9th in Het Nieuwsblad, 10th in Sanremo and 7th in E3. Alberto Bettiol– 3rd place and 2nd place in Tirreno stages, attacked on the Poggio in Sanremo and 4th in E3. Last year we witnessed the biggest front group since Degenkolb won in 2014, which was a surprise. Even more surprising was the presence of many sprinters: Viviani, Démare, Laporte, Debusschere and Modolo. QuickStep had four in the front group and decided to commit to Viviani and ensure we got a sprint, but Sagan got the better of their man in the finish. This year we’ve witnessed the puncheurs riding at an unrivalled level, I’m not confident that the sprinters will be able to keep in contact over the Kemmel, especially if we’ve had a hard race up until that point. Greg Van Avermaet – rode a perfect race on Friday, but in using up a lot of energy, he couldn’t win the sprint. It was he who smashed the race apart on the Paterberg and it was he who smashed everyone on the Tiegemberg. He might have “only” finished 3rd, but Van Avermaet was the most impressive rider in E3. He won here in 2017, he’ll be confident of claiming his 2nd win this year. He’ll be very happy if we do get some echelons, particularly if it depletes the strength of QuickStep. Peter Sagan – was he really dropped because of a mechanical? If so, then confidence will still be high coming into this race. If not, Sagan will have a few doubts about his form, something that doesn’t usually happen. This is a race that really suits his characteristics, he’s already on it on three occasions. Last year he had Marcus Burghardt with him at the end, it would be a big help if one of his teammates survives with him this year. Zdenek Štybar – as I’ve mentioned, his form is amazing. He’s climbing very well, the final ascent of the Kemmel will excite him. QuickStep have multiple options, as always, we’ll have to see who they decide to ride for. Given his form, one of those protected riders simply has to be Štybar. He showed on Friday that he doesn’t have to arrive solo, he’s also sprinting very well. Yves Lampaert – another QuickStep option. The Belgian champion would have been disappointed with his performance on Friday, he seemed to struggle on the Paterberg. This race has less climbing, something that suits him better. His role in the team will depend on Viviani and if QuickStep are trying to set it up for a sprint. Oli Naesen – he hates the Tiegemberg! After looking great throughout E3, he blew on the final climb, not the first time he’s struggled there. After going brilliantly in Sanremo, it would have hurt him to not be in the mix for the win. Looking ahead, this is another race that suits him well, particularly if the wind blows and it becomes selective. Tiesj Benoot – another rider who was disappointed on Friday. Benoot was riding a good race, but poor positioning for the Paterberg cost him dear. He’ll learn from that, remember, he is still a young rider! This is only his second appearance in Gent-Wevelgem, he was 15th on debut back in 2016. The route is one that suits him, and he’ll be keen to bounce back after the disappointment of E3. Matteo Trentin – incredibly consistent just now. The Italian is constantly hanging around the front of the races, but he’s just falling short. He should take a great amount of confidence from the way he’s riding; the win will come. The important thing for Trentin is to remain cool and not get desperate. Mathieu Van Der Poel – we’ve all been looking forward to this. The cyclo-cross superstar has been dipping his toe into road racing, but the time is now right for him to ride a classic. His confidence will be high, he destroyed everyone in GP Denain. I know what you’re thinking, that’s a much easier race than this. You’re right, but he’ll be confident of coming here and winning the race, it’s what he does! A master on the cobbles, he also packs a fierce sprint. My worry is the tactical side of the race, this is new for him and there is no guarantee he can cope. He’ll need a wise DS to guide him through the race. Wout Van Aert – his move to Jumbo-Visma has been a big success. Recent races have gone very well, and Van Aert must now be thinking about how he can get that first win for his new team. His sprint is quick, but a number of the main contenders are faster than him. This means to win the race he’ll need to attack and not wait for the sprint; is he brave enough to do this? Elia Viviani – after his performance in Sanremo, I have no confidence in him for this race. QuickStep rode for him in 2018, I’m not sure they’ll repeat that this year. Viviani has doubts about his ability to sprint after a long day in the saddle, so do I.
Fernando Gaviria – I just don’t see this being a day for the sprinters. A selective race, thanks to the wind. With a number of riders enjoying good form, I think we’ll see Oli Naesen take a big win.